We are offering 3D Solids Set 5CM, Transparent 17 PCS. 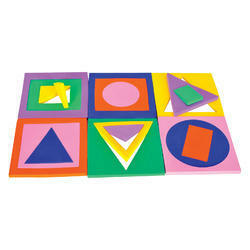 Large Geometric Shapes add a tactile element to geometry lessons. Each shape has a 5 cm dimension set of 17 shapes, allowing you to illustrate relationships between area, volume, shape, form and size. Transparent plastic shapes include: cone, sphere, hemisphere, cube, cylinder, rectangular prism, hexagonal prism, triangular prism and square pyramid and many more Teaching Notes included. 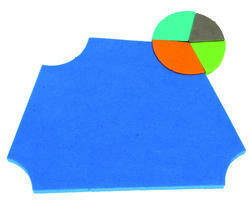 Teaching geometry area and measuring facts is easy with activities using 3D geometric shapes. Introduce students to solid geometry and investigate shapes, faces, vertices, edges, curves, and angles with this 17-piece set of plastic Shapes. We are offering 3D Solilds Set 10CM, Transparent. Large Geometric Shapes add a tactile element to geometry lessons. Each shape has a 10cm dimension set of 17 shapes, allowing you to illustrate relationships between area, volume, shape, form and size. Transparent plastic shapes include: cone, sphere, hemisphere, cube, cylinder, rectangular prism, hexagonal prism, triangular prism and square pyramid and many more Teaching Notes included. 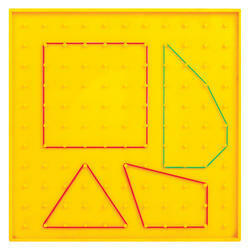 Teaching geometry area and measuring facts is easy with activities using 3D geometric shapes. Introduce students to solid geometry and investigate shapes, faces, vertices, edges, curves, and angles with this 17-piece set of plastic Shapes. It has certain number of equally spaced Peg and arranged on two different circumference of a circle and one peg at the center. Dimension = 20 cm X 20 cm. Number of pegs 25. 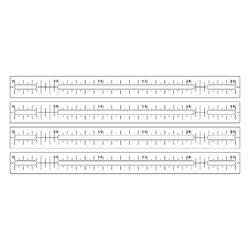 This Transparent Geoboard is 9" x 9" in measure & can be used on overhead projector. It has 11 x 11 peg grid. The knobbed pins hold rubber bands (included) in place. 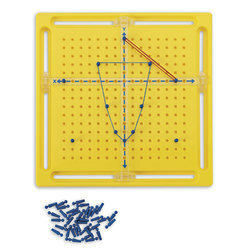 The Geoboard is primarily used in the exploration and recognition of shapes, designs, spatial relationships, angles, fractions, area, perimeter, symmetry, and coordinates. It is suitable for ages 5 to 13. 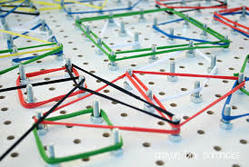 Isometric Geo board allow to create 3 dimension figures, pattern block activities and other interesting games. 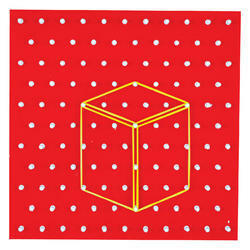 Dimension = 20 cm X 20 cm. Number of pegs 105. Geo Geometry Stick's is easily snap together to motivate students to explore plane geometry on their desktop or on the overhead projector. Students will discover what happens as they use the same length sticks versus different length stick to build various polygons, as they attach additional sticks they study polygon heights, calculate their areas, find centre points and much more! We are leading Manufacturer of Angle Sum Property of Cyclic Quadrilateral and our product is made up of good quality. A very common task in math class is to plot and name points on what we call the co-ordinate board, more commonly known as a four-quadrant graph. We offer co-ordinate board game with color counters and dice to understand this difficult maths topic in the form of game. This article shows you the steps for plotting and naming points on a co-ordinating board. 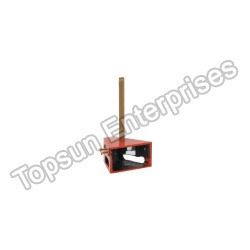 We are leading Manufacturer of Cross Vertical Staff and our product is made up of good quality. 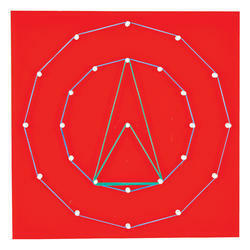 The large Geoboord is primarily used in the exploration and recognion of shape designs, spatial relationships, angles, fractions, area, perimeter, symmetry, and coordinates. It has 1 1 x 11 peg grid at one side and circular pegs on another side. The knobbed pins hold rubber bonds [Included) in set. Moulded Plastic Strip having 3 holes of dia 5 mm at a distance of 50 mm, 120 mm and 190 mm from one end. 4 slots 125 x 5 mm with both ends rounded to semi-circle. Moulded Plastic Strip having 3 Slots of dia 5 mm at a distance. Moulded Plastic Strip having 2 holes of dia 5 mm at a distance of 50 mm and 120 mm from one end. 3 slots 125 x 5 mm with both ends rouhded to semi-circle. 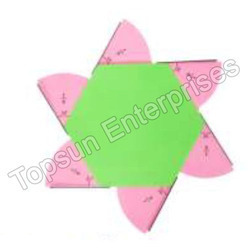 Large Geometric Shapes add a tactile element to geometry lessons. Each shape has a 4cm x 8 cm dimension set of 12 shapes, allowing you to illustrate surface area, volume, shape, form and size. Opaque plastic shapes include: cone, sphere, , cube, cylinder, rectangular prism, hexagonal prism, triangular prism and square pyramid and many more. 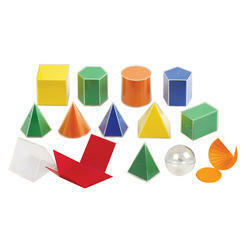 Teaching geometry area and measuring facts is easy with activities using 3D geometric shapes. 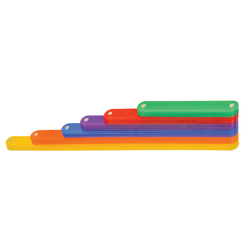 Introduce students to solid geometry and investigate shapes, faces, vertices, edges, curves, and angles with this 12-piece set of plastic Shapes. 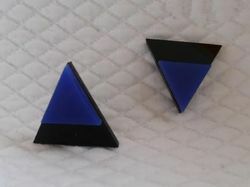 We are leading Manufacturer of Ratio Of Area Of Similar Triangles and our product is made up of good quality. To verify the result that ratio of the areas of two similar triangles is equal to the ration of the squares of there corresponding sides. 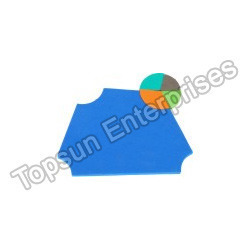 We are the manufacturer of Stencils.This set of 10 plane colourful geometrical magnetic figures are best for tracing on board and explain concepts related to shapes and its related properties. 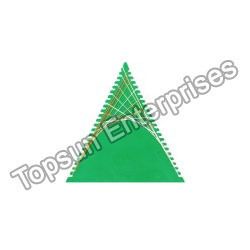 This opaque plastic Geoboard is 195mm x 195mm in measure & provided with steel pins to insert in the required place depend on the activities. 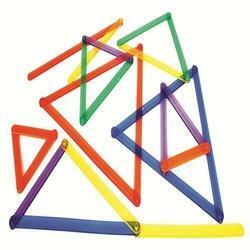 This Geoboard can be used both the side. It has 18 x 18 pin hole grid. 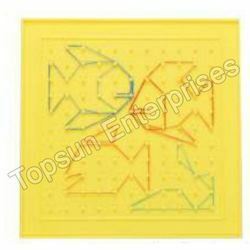 This Geoboard is so versatile, child can convert this normal 2 D Geoboard to isometric Geoboard to make 3 dimensional figures. It has certain number of equally spaced pin holes arranged on the circumference of a circle and one pin hole at the center.